Of all the unread books on my shelf back home, none is more intimidating than Murasaki Shikibu’s The Tale of Genji. The translation I own, the 1926 translation by Arthur Waley, lands at over a 1000 pages. Murasaki, a lady of Japan’s Heian court, wrote Genji roughly a thousand years ago, with the novel itself tracing the tumultuous life of the titular Genji and his various affairs with woman as his status rises and falls in the imperial court. 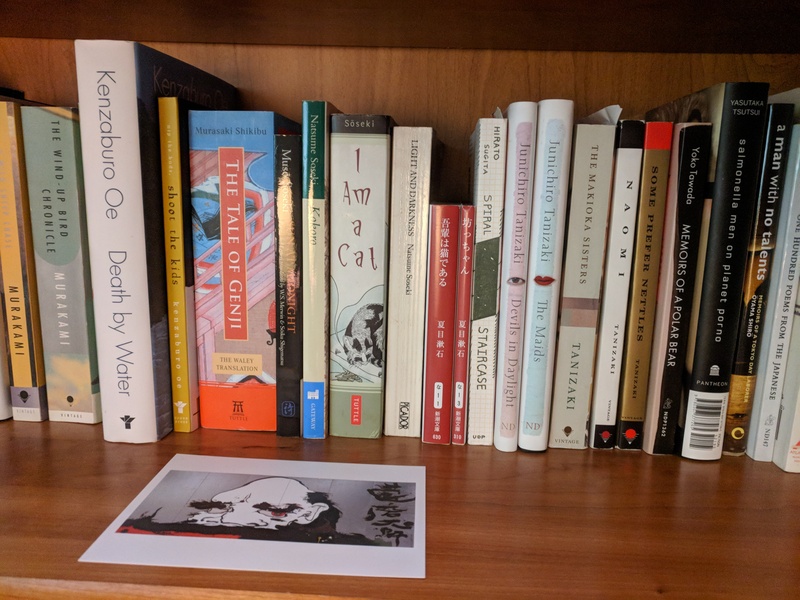 The novel is a cultural touchstone for Japan, as much as The Great Gatsby or To Kill a Mockingbird, is in America, but is not widely read cover to cover, having been distilled into a backbone of Japanese culture. In Japan, The Tale of Genji enjoys cultural ubiquity. Southeast to the hustle and bustle of Kyoto and only a few train stops away is Uji. A sleepy town of 200,000, Uji gets its claim to fame on three things: high quality green tea, beautiful old temples, and the last ten chapters of The Tale of Genji, the novels setting shifting from Kyoto to Uji in those final chapters. With Uji only a 35 minute, 350 yen (about $3) train ride away, I jumped on the opportunity to go, coming for the Genji and staying for the tea, temples, and (as is it Fall) leaves. Though not utilized as a selling, the town is absolutely gorgeous. A bridge greeted my friend and me as soon as we left the station, giving us a panoramic view of the surrounding mountains, flush with color from the changing seasons. The wide river passes swiftly under and babbles. The sun flickered shown on the far away mountains that fenced in the valley. 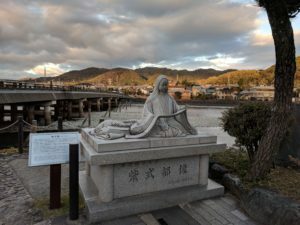 A statue of Murasaki Shikibu sat across the river, at the threshold of the street leading up to the famous Byōdō-in temple. That lead up street to the Byōdō-in temple serves as the town’s main tourist street and thankfully spares visitors from the usual touristy trinkets, instead opting to sell the town’s high quality green tea. The tea does go tourist at a few stores though, with one advertising green tea ramen and another octopus balls (takoyaki) with a green tea sauce on top. My friend and I opted to drink the stuff in its familiar, liquid form. I can report back that, at least to my unrefined pallet, the tea lives up to its tasty hype. After some tea, we enjoyed a walk around Byōdō-in temple (a visit deserving of its own article) before wandering into a park on a small island that splits the Uji river. 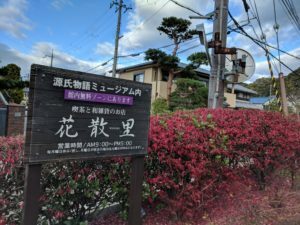 The scenery continued to impress, as we found our way to The Tale of Genji Museum, situated in an upper scale neighborhood just north of the train station. 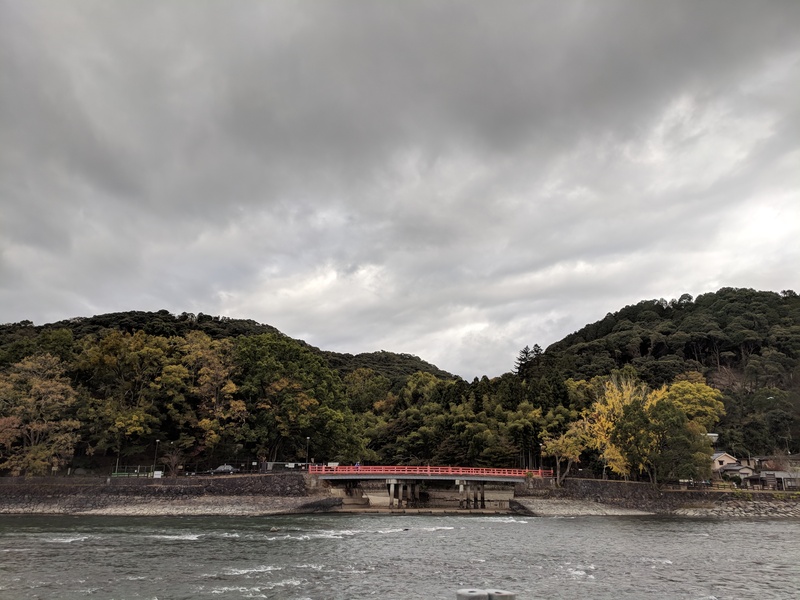 On our way there we passed the statue of Genji (pictured above) overlooking the river and a few bridges built to look much as they did a thousand years ago. The Genji Museum was a charming, containing exhibits of Heian period life and small wax figures dressed in period clothing acting out scenes from the novel. Both Uji and the museum stand as a testament to the lasting appeal of one book and its persistence as a cultural influence for one thousand years. When you and I are gone, Genji will remain. Dinner in Uji was at one of those mishmashes of Japanese and Western culture that so many people find inscrutable or call a simple mockery of Western culture: a chain Italian restaurant “family” restaurant Saizeriya. I find the decor no more a far cry from Italy than your average Olive Garden, and I was too busy enjoying my squid and octopus topped tomato creme pasta and buffalo cheese pizza (all for under 900 yen!) to really mind. If one thing won’t make you miss home in Japan it’s the food. As we swiped through the ticket gates at the station and waited on the platform for the train, I took one last look at Uji, knowing I was unlikely with my remaining time in Japan to return. 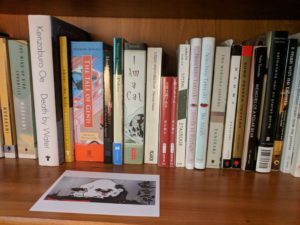 The feeling was akin to finishing a book and putting it back on the shelf. The opportunity to return to it would be there, but until I do return, it would have to live in my memory.